Joining Bart this month are Chuck Joiner from Mac Voices, Gazmaz from the MyMac Podcast, and Lynda Gousha. 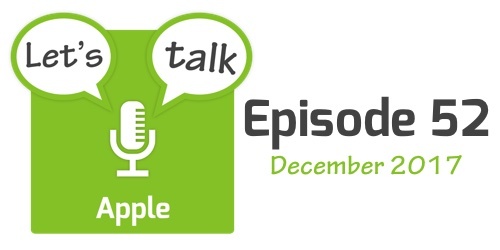 The show starts with some quick follow-up stories, some Apple-related notable numbers, a few Apple-related legal stories, some staffing changes at Apple, and some Apple acquisitions and investments that made the news in December. The four main stories for the month are the launch of Apple Pay Cash in the US, availability of the iPad Pro, *Battery Gate*, and the rumoured unified developer platform *Marzipan*. The show finishes with a quick rundown of some shorter Apple-related stories that made the news in December.